Whether you are a Game Master seeking to add more depth to the dragons of your campaign or a player hoping to learn the secrets of the dragon slayer we invite you to join us on a journey into the hidden world of the dragon. Along the way we will learn the secrets of these tremendous beasts, their arcane sorceries, their mating habits, methods of warfare and more. 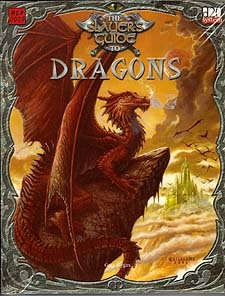 Within these pages new types of dragon are revealed for the first time and numerous lairs are described. All this is but a sample of the occult facts we will learn as we dig into this newly discovered trove of dragon lore. * Physiology of Dragonkind: Where does the great sorcerous power of dragons come from? How do their breath weapons actually work? Why are they nigh on impregnable to any weapon? * Dracos Invictus: The true lord of dragons - discover a whole new age category never before revealed. * New Races of Dragons: Track down and slay the Abyssal Serpent, Dragonkin, Hell Worm, Mirth Drake, Rock Dragon, Sea Dragon and Web Dragon. Also revealed for the first time is Baal Shiruat, the Chromatic Prince. * Habitat: Wander directly into the lairs of the most powerful dragons yet seen. * Dragon Society: Find out how dragons relate to one another, hunt crossbreeds and consider the terrifying implications of the Dragon Moot. * Methods of Warfare: The dragons you have faced up to now have been but mere weaklings. Discover how a true dragon fights, along with new feats, magic items and full rules for classed dragons. * Roleplaying with Dragons: An encounter with a dragon is a singular moment. Learn how to make sure your players never forget it! * Scenario Hooks and Ideas: A dozen adventure ideas just waiting to be used!